LAST FEW EARLY BIRD TICKETS ON SALE NOW! FOLK, ROCK, BLUES & LOTS MORE, IN THE BEAUTIFUL SURROUNDINGS OF THE CASTLE GARDENS, STANHOPE, FOR BOTH CAMPERS AND DAY VISITORS. LOADS OF GREAT BANDS ACROSS TWO STAGES - ONE GREAT WEEKEND ! Set on the same site as the famous Stone Valley Festival (www.stonevalleyfestival.co.uk) and organised by the same team, Northern Kin Festival is back for a second year. Created by a dedicated team of live music lovers, Northern Kin is perfect for lovers of Folk, Blues and Rock music, with a few musical surprises thrown in for good measure. There'll be more than 15 hours of wonderful live music to enjoy in the main marquee, and even more on the new second acoustic stage, all in a beautiful rural setting, that is completely secure for all campers and only a short stroll from the village of Stanhope, with a safe, friendly atmosphere for all ages. Come and join us and enjoy a great weekend for all ages! The music will be staged in our huge marquee, with brilliant sound and lighting on the music stage, plenty of room to bring a chair or blanket, or have a dance, lots of interesting trade stalls, food from around the globe and a fully licensed bar, including a selection of quality real ales, plus a second stage featuring a huge array of acoustic talent, so you're never short of entertainment. And the best news of all is that the bar, food and tickets are all at fantastic value for money prices, to create a special weekend of fantastic live music that everyone can afford. 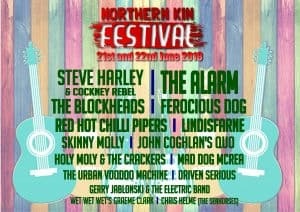 Northern Kin will be there to entertain you - not hurt your wallet! If you love a variety of fabulous live music in a beautiful, picturesque setting, with lots of like-minded people then don’t miss it and we’ll see you there! Like us on Facebook and get festival updates.